This was my first time making bagels. Well, it was actually my first and second time, because I had to work out some wrinkles in my method. Our host kitchen at Karen's Kitchen Stories decided that this month would be the time for bagels. 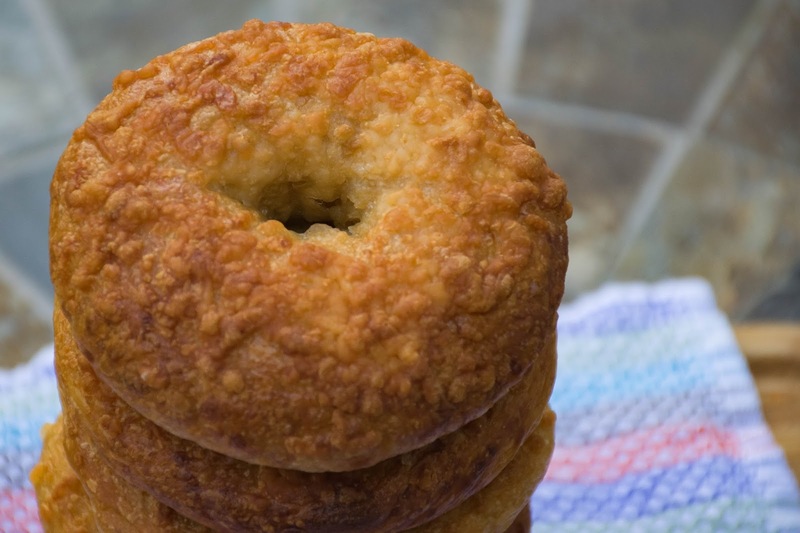 More specifically Asiago cheese bagels, which are evidently a coveted item in an assorted bagel box from Panera Bread. Wait a minute though, those bagels in the picture aren't cheese bagels... Yeah, well it took me another try to get my bagels to turn out properly and look like bagels should look, so I chose a different flavor the second time and that picture comes first. Besides, I am the only person in the family who ever eats bagels and definitely the only cheese bagel person. Boy did I hear it about the smell of the Asiago! I thought it smelled wonderful, like an artisan grilled cheese smell. Nope, it was stinky cheese to the rest of the fam. ☺ Gotta say though, the cheese ones were quite delicious toasted and buttered, even if they were a little flat. You'll find out how to avoid flat bagels here when I explain what happened. I learned my lesson and the next batch were nice and round. I made them a bit smaller as well. 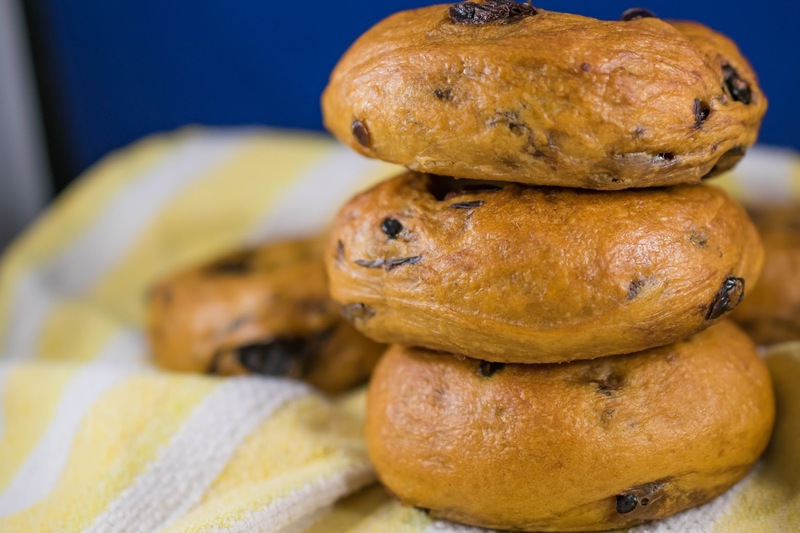 Bagels are very filling, no need to make them giant gut busters. Most bagels tend to be around 113g before baking and I ended up going just a little smaller at 96g but got an extra couples bagels out of it. 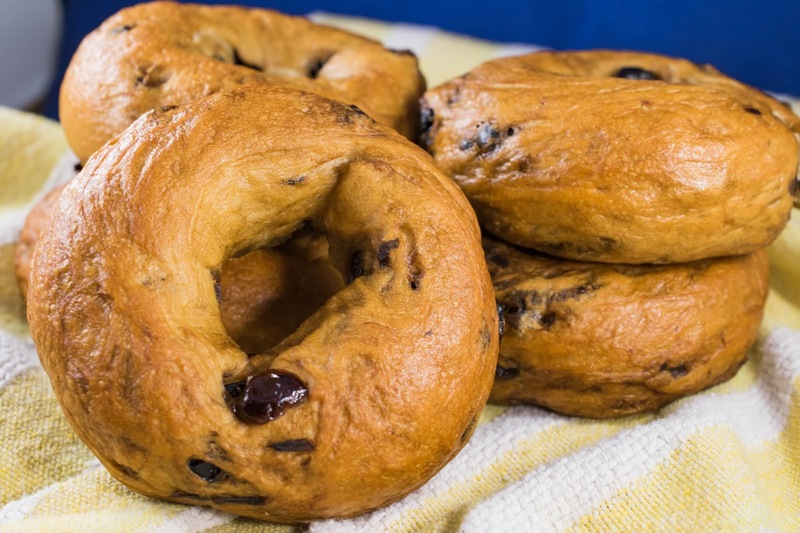 The cool thing about this recipe is that you start with a simple bagel dough and then can adjust the ingredients or toppings for the flavor desired. 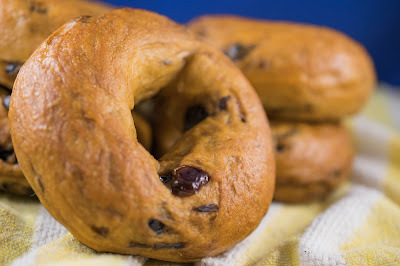 For my second run, I chose a cranberry ginger bagel and simply kneaded 6oz of dried cranberries and 1oz of crystallized ginger chips into the dough. This is a great recipe to try because the dough is very easy to work with since it is a comparatively dry dough. And you can make your favorite flavor! We'd love for you to bake along with us this month. Simply choose your flavor, boil and bake some bagels, and send a picture and/or your post to our host kitchen by the 29th. Your post/picture will be included in a buddy round-up and you will receive a "buddy badge" graphic to include in your post and brag about. You can make a half batch easily and end up with 5 beautiful bagels that will also freeze well. And here is the recipe, adapted from Peter Reinhart's artisan breads everyday. I used a combination of about one third light spelt and two thirds all purpose, which gave me a nice, chewy bagel because of the strong gluten in the spelt. For the dough, dissolve the malt syrup or honey, yeast and salt in the lukewarm water in the bowl of a stand mixer. Add the flour and mix on low speed 1 with the dough hook for three minutes to blend well. The dough should be stiff and coarse in a ball, with all the flour incorporated. If there is still some dry flour, stir in a little more water. Let the dough relax for 5 minutes. Add the cheese and mix again for three minutes on low, or gently by hand until the dough has smoothed out and the gluten is developed. It will be stiff and supple, satiny and barely tacky. If it feels too soft or very tacky, work in a bit more flour. Don't worry if some bits of cheese poke or fall out. Cover and let the dough rest and rise for an hour at room temp. To shape the bagels, line a sheet pan (or two) with parchment and spray it with cooking spray or lightly coat with oil. Divide the dough into 8 pieces or more as desired. 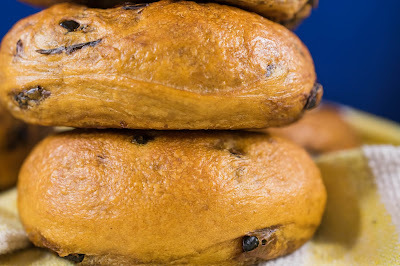 (Bagels are generally 4oz or 113g before baking.) Form each portion into a ball by pinching together the edges and then rolling on a clean surface under your cupped hand. (Don't use flour.) Choose one of two methods to shape your bagels. For the first method, you poke a hole through the center of a ball to make a donut shape, then expand the hole to 2 inches by stretching the hole with your thumbs as you rotate the bagel. The next method is preferred by professional bakers. Use both hands to roll the ball into a rope, 8-10 inches long on a clean surface. Taper the ends slightly. Moisten the last inch or so of the ends and wrap the rope around your hand so that it joins across the palm. Roll those ends together lightly on the work surface with your palm to seal. Squeeze to even out the diameter if necessary, leaving a hole of about 2 inches in the middle. Place the shaped bagels on the oiled parchment and brush or spray with more oil. Cover the whole pan with plastic wrap and refrigerate overnight or as long as 2 days. Take the bagels out of the fridge about 60-90 minutes before you plan to bake them. Immediately check whether the bagels are ready to be baked by using the "float test": Put one of the bagels in a small bowl of cold water. If it sinks, shake it off, put it back on the sheet, and try again in 15-20 minutes. When one bagel passes the float test, they're all ready to be boiled. If they are ready before the boiling liquid is ready, return them to the fridge so they don't overproof. Okay, STOP right here and I will explain about flat bagels. I did as instructed the first time and though my kitchen was not super warm, my bagels were way too proofed by the time I did the float test at about 60 minutes. That means when I picked them up to poach, they deflated, when they boiled, they wrinkled, and when they baked, they stayed relatively flat. I also hadn't expected them to be ready yet, so my poaching liquid was not ready and boiling. Even sticking them back in the fridge didn't help. For my next batch, I did a float test on one bagel straight out of the fridge and it PASSED. Now supposedly, when one bagel floats, they are all supposed to float. Nope. It depends on where you had to stick the baking sheet in the fridge. Mine was up at the very top and the bagels at the back were much colder. So the front ones floated and the back ones sunk. I don't think an extra 15 minutes for cold bagel dough will hurt the ones that are ready while the sinkers proof a bit more. You do want them to pass the float test though, because otherwise they will take too long to rise to the surface of the poaching liquid and will end up being dense. I could tell which ones needed more time because they were still solid and heavy with no rise whatsoever. The front ones that floated did have a tiny bit of puff to them. They will expand quite a bit in the water. If they wrinkle or deflate, they proofed too much before poaching. Hope that helps! For the poaching liquid, fill a wide pot with 2-3 Qts water at least 4 inches deep. Cover and bring to a boil, then keep at a simmer. Add the malt syrup or honey, baking soda and salt and stir to dissolve. Preheat the oven to 500º F.
Gently lower each bagel into the simmering liquid. Add as many as will easily fit in the pot. They should float to the surface within 15 seconds. Use a slotted spoon to turn the bagels after one minute. Poach for another 30 seconds to a minute and then transfer back to the pan with the slotted spoon. Place the bagels domed side up. (Remember that the parchment needs to be oiled or the paper will stick to the bagels during baking.) Immediately sprinkle the bagels with the cheese topping. Repeat with the remaining bagels. Put the baking sheets in the oven and lower the heat to 450ºF. (My oven runs hot and my bagels did much better at 425ºF.) Bake for 8 minutes, then rotate the pan and check the bottoms for brownness. If they are getting too dark, slip another baking sheet underneath for insulation. (I used air bake sheets so this was not an issue for me.) Bake for another 8-12 minutes until golden brown. Remove to a wire rack and cool for at least 30 minutes before slicing or serving. For other flavors, either sprinkle the desired toppings on the bagel as soon as it comes out of the poaching liquid, or to make them stick better, use an egg white wash (1 egg white + 1 tbsp water whisked together) on the bagels before adding toppings. Anything like dried onions or garlic will need to be re-hydrated for at least and hour before topping, or it will burn in the oven. 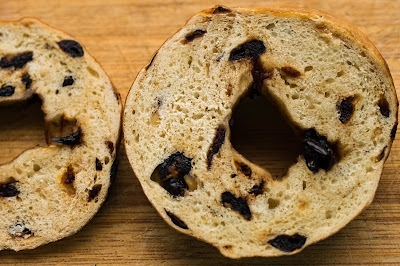 For cinnamon raisin bagels, add 8oz of raisins during the last mixing, same as the cheese, and optionally, add a half tsp of cinnamon to the flour during the initial mixing. 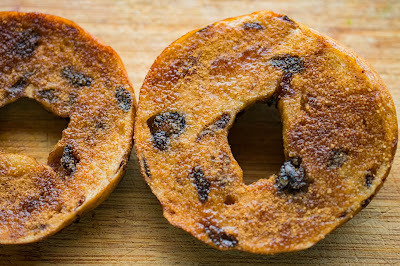 Don't top with cinnamon sugar before baking, instead brush the hot bagels with butter after removing from the oven, and dip them into a cinnamon sugar mixture. Or if you don't want to deal with brushing and dipping, then just slice and toast, butter the inside and sprinkle with cinnamon sugar when you eat it. It's less messy for storing them that way too. 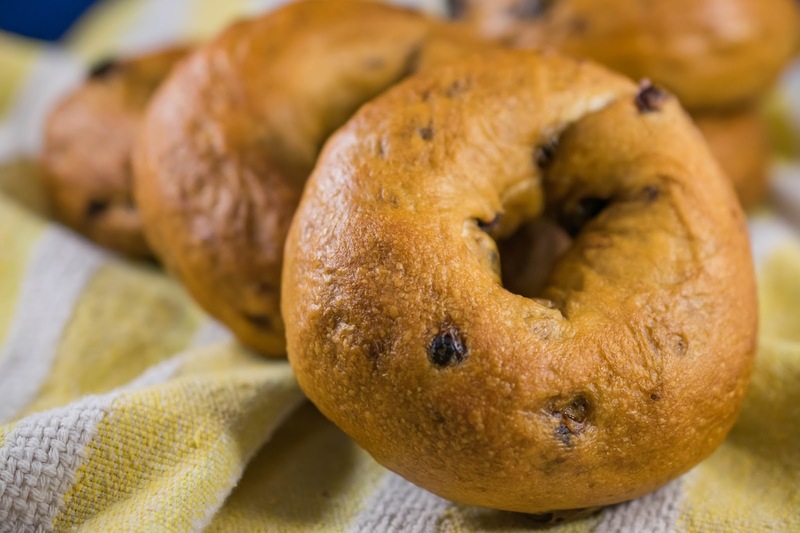 Whatever flavor you decide to make, you'll enjoy nice fresh bagels from home! Those look great Kelly, and your cheese ones look pretty round to me! Thanks for baking along. Personally, I think all your bagels look perfect. Come on now. Fess up. 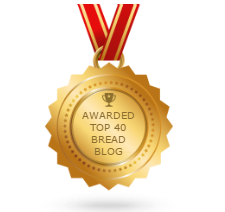 You were just saying that the Asiago bagels didn't turn out and that's why you made more, weren't you? Ooooh, I bet that thinly sliced Asiago would be delicious on a cranberry ginger or cinnamon raisin bagel! You did a fabulous job for this being your first attempt at baking bagels. I loved the cheese version, but your cranberry and ginger version sounds wonderful! Your bagels are lovely.... And I also prefer a smaller bagel (when I can find them) Then I can enjoy it with lots of whatever and no guilt!